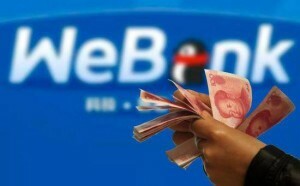 WeBank, founded in late 2014, is the first private internet bank in China. Tencent owns a 30% stake in WeBank, while investment firms Baiyeyuan Investment (Not listed) and Liye Group (Not listed) each own 20%. The entity as a whole has registered capital of Rmb3 bn (US$482 mn). WeBank’s scope covers personal banking, corporate banking, and international banking. In May 2015, WeBank launched its first product ‘Weilidai’, providing personal credit lines to users without the need for guarantee or collateral, on a limited scale of users. The loans were first made on Tencent’s QQ and then were available on WeChat. Users can borrow between Rmb500 and Rmb200,000. So far, not all users on WeChat or QQ can access this lending service. Loans are offered based on a ‘white list’—selected by WeChat and WeBank teams as first group of targeted users based on their risk profile. As of end-December 2015, the loan balance was Rmb7.5 bn, and so far there is a total of 660,000 users who have borrowed money from Weilidai. And the number of white list users has reached over 20 mn. Alibaba and Ant Financial launched MyBank in June 2015. The new bank is “not for the rich, but for the little guys,” said Executive Chairman, Eric Jing. MyBank offers loans up to Rmb5 mn (around US$800,000). It also promises to offer smaller loans than regular banks normally would. MyBank is backed by Rmb4 bn (US$646.3 mn) in capital. With no physical branches, this new business will save significantly on operational costs compared with the traditional ones. In October 2015, MyBank launched Koubeidai, a product for small offline stores and local merchants. Customers who register on Koubei.com get priority in borrowing loans up to Rmb1 mn. Before that, in April 2015, Alibaba had already launched its consumer finance and lending business, Huabei, which offers a credit limit up to Rmb30,000 for users to purchase on Taobao/Tmall. In November 2015, Baidu partnered with China CITIC Bank in establishing a JV called Baixin Bank, a direct banking firm. This new bank will have registered capital of Rmb2 bn, with CITIC Bank taking the majority share. Baixin Bank will have the advantages of both internet-based operations and the convenience of traditional banking accounts. Although all the three giants established their ‘internet banks’, their business model is not quite the same. Alibaba’s MyBank has launched micro loan and consumer financing businesses. It lent money from its own balance sheet and took the credit risk by itself. Tencent’s WeBank is more like a platform, which connects borrowers with lenders, without taking risk. Baidu’s Baixin Bank is positioned as a direct bank. You may also be interested to read on How Online and Mobile Payment ecosystem has evolved in China ?